Vegan Miss | It's the Bee's Knees, Daddy! Vegan Miss will be taking an indefinite hiatus for the time being. Your blog doll may periodically post things, but not as far as a regular schedule goes (if you haven't been able to tell from the lack of posts). Don't worry! Miss Lexy is still cooking and trying out new vegan products, restaurants, and places! She's just been very busy with school and graduating with her second degree (ah, real life problems!). Miss Lexy apologizes for this hiatus, but hopes to return back to Vegan Miss and blogging in the next year. Thank you for all the support and reading (or trying to cook) Vegan Miss recipes and reviews! I've made two vegan Springfield, IL posts in the past (part one and part two) and to my surprise, both were very well received. I didn't think people would be that interested in the vegan options down south from Chicago, but then again, a lot of people go to the state capital for work. President Obama used to go down to Springfield and eat the Holy Land Diner occasionally before he was president (so the owner tells me!). Since I last posted those entries, I have found out that Osaka's hibachi onion soup is not vegan. I've been told several times that it is, but this last time I've asked, they said it has chicken broth in it they think. For safety sake, I'm just not going to order any soups there anymore. That would be my recommendation to readers as well. Cafe Brio has turned over to new ownership, so I'm excited to see what vegan options they may have now (which I will blog about!). Actually, a guy that graduated high school with me is one of the new owners. I've asked him to add more vegan options since the change in ownership! I've also since eaten at Cafe Andiamo downtown. I had the veggie sandwich with salad (both request without cheese). It was a good and filling lunch! I didn't ask if one could remove the cheese from their pizzas to make it vegan, but next time I go I will ask. There are a couple other vegan options on their menu too (hummus and bruschetta without cheese). I would recommend checking out this cafe if you are downtown during lunch hours. Kiku has changed locations to basically across the street to where they were originally, just for FYI. Several new restaurants have opened in Springfield since my last posts. First, there is an awesome microbrewery downtown now. It's called Obed & Issac's and I'm obsessed as well as all my friends who have been! Not only is this microbrewery a hip place to hang out (in a very old, cute building that used to be a funeral home - spooky! [psst, they give tours of the property]), but there are a bunch of vegan and vegetarian options. Their beer is brewed right next door and they have big glass windows you can look into to see the area where they brew. I'm a fan of their Ditzy Blonde beer. There is a really nice outdoor seating area in the front which was fun during the summer with a beer and brunch or dinner. They are also dog friendly! You can bring your pooch and sit outside with them. They sell doggie biscuits made from their spent grains from the brewery. Don't forget you can take home a growler of beer too (and bring back the growler to refill!). For appetizers, vegan options include the triplet of dips and house-made chips. Other possible vegan options (haven't asked) include the black and tan onion rings and the Bavarian pretzel rolls (without cheese). There are several other vegetarian appetizer options that include cheese too. I've had both the triplet of dips and the house-made chips. Both are to die for! I'd go with either, really, but I really enjoy the hummus in the triplet of dips (hummus, black bean dip, and pico de gallo with fried pita chips). The malt vinegar added to the house-made chips is really tasty too. The salad options include the Asian Chicken Salad (without chicken) and the side salad (no cheese or croutons). The veggie burger is vegan (not house-made), just get it without the mayo. I love getting this sandwich with pub fries or the house-made chips and vinegar. Super yummy and goes down great with a Obed & Issac's beer. The pappardelle is another option (dinner only). Be sure to get red sauce and ask for no cheese. I really liked this pasta, though it has kind of a kick to it! Lastly, Obed & Issac's has Sunday brunch from 11 a.m. to 2 p.m. My friend and fellow blogger, Emily from Running on Vegan, and I have gone there for brunch and they made us special vegan breakfast plates. Basically, they gave us a portion of potatoes and a veggie scramble of sorts with toast (so no eggs). Not too many places in Springfield will make you something like that for brunch. I can't even think of a place one could go to get a Bloody Mary (though, those aren't vegan) or mimosa and have a vegan brunch other than maybe Cafe Brio. In conclusion, I am thoroughly impressed and in love with Springfield's very own microbrew. Check it out! Newcomer to Springfield is Donnie's Homespun. They have an original location in Decatur and decided to expand to Springfield taking the home of what was once the Pizza Machine. Donnie's Homespun is located in Vinegar Hill Mall along side Holy Land Diner. It's super hard to choose which to go to on a Saturday night now since Holy Land has their fantastic vegetarian buffet for only $10 on that night. Donnie's is very vegan friendly with many appetizers and entree's to choose from. The menu is marked with vegetarian items (which there are a lot more to choose from if you are not a vegan but a vegetarian). To start, one can get the vegan antipasto. I've gotten this twice now. It's a big appetizer, so be prepared to share. It comes with garbanzo beans, olives, giardiniera, tomatoes, garlic, spinach tossed in a pesto vinaigrette served with hummus and pita. Other appetizers include hummus, chips and salsa, and chips and guacamole. There are two burgers on the menu, but I have not asked if they are vegan since I normally get pizza here. They include a veggie burger and a black bean burger (get both without mayo and cheese if it's vegan!). Donnie's has a number of wraps too include a hummus wrap, a Indian curry wrap, and a falafel wrap that are vegan. On their lunch menu, they have a BBQ tofu wrap as well. I've had the Indian curry wrap and the falafel wrap. I preferred the falafel to the curry wrap. I kind of was overwhelmed with the curry wrap and felt like I should be eating it with a fork as curry is intended. The flavor was good, though, as was the falafel wrap. Now, for the exciting part: the pizza. 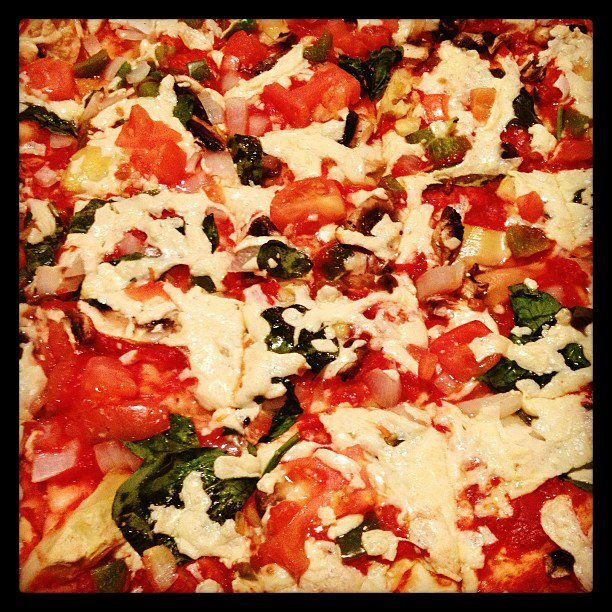 Donnie's has Daiya vegan cheese! Be warned, the red sauce has Parmesan in it, so ask for the vegan pizza sauce. I like to build my own thin crust with a variety of veggies like tomato, spinach, garlic, basil, artichoke, mushroom, onion, etc. I'm not sure if they can make a vegan deep dish. It would be worth asking! Next time I'm in, I'll ask. For dessert, there is a vegan carob brownie! Aside from the fantastic vegan food at Donnie's, they are a venue for musicians as well. To date, a number of fun bands have played there including Marky Ramone, Reverend Horton Heat, and the Giving Tree Band (also vegans!). Reverend Peyton's Big Damn Band is set to play there on Friday, March 1st at 9:00 pm as well. Buy tickets here. 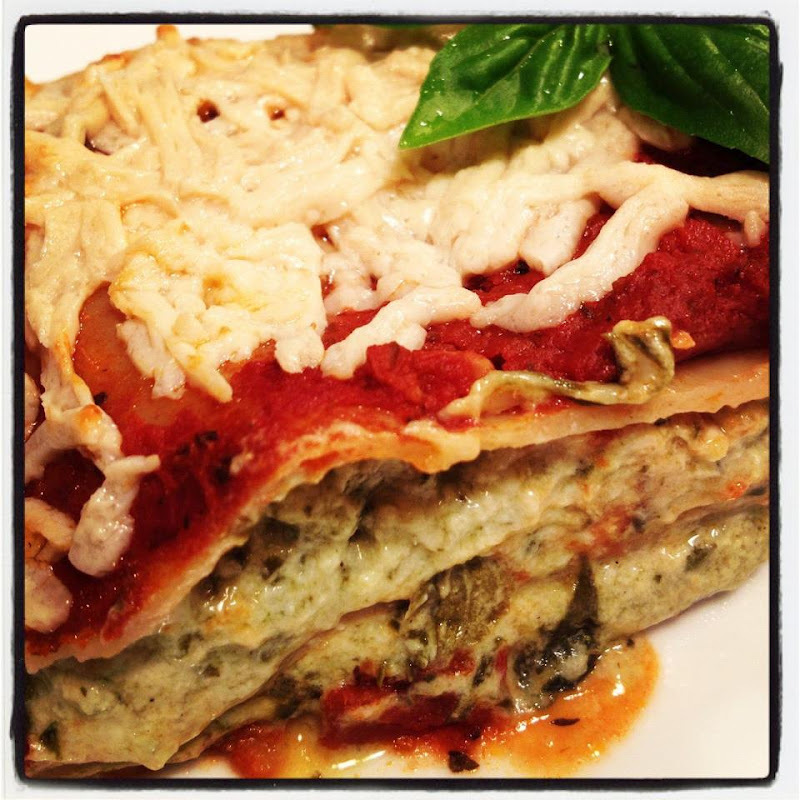 Go and enjoy some awesome vegan grub and music at Donnie's Homespun! iCream cafe is a really neat ice cream parlor in Wicker Park. 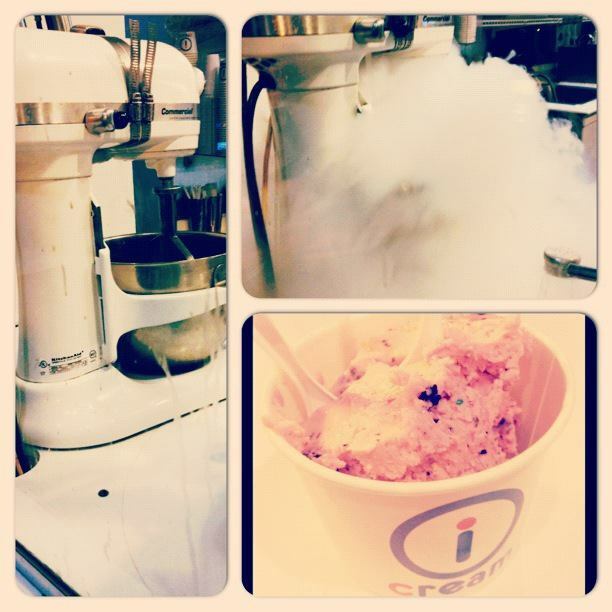 They make the ice cream from scratch in front of you with liquid nitrogen. It's a cool experience for the first time (get it? cool?). They carry soy ice cream base and a variety of vegan toppings to choose from. On Friday and Saturday nights, they're open pretty late, so it's a cute place to get some ice cream after dinner. You begin by choosing a base (soy ice cream), then a flavor, and lastly toppings. They have candy, fresh fruit, and other toppings like nuts. You can chose to dye the ice cream too (say pink or blue). For a medium ice cream with all the works, expect to pay about $6-7. iCream also has coffees and teas to chose from as well on their menu. Your blog doll has been super busy lately. Sorry for not often posting. Quicky recipe! Heat a skillet over medium heat. Add the oil and onions. Cook until they start to become translucent. 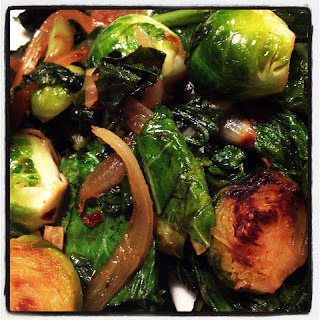 Add the brussel sprouts. Cook for about 5 minutes or until the start to become tender. Add in the greens and garlic. Cook for another 5 minutes. Add the remaining ingredients and cook until the liquid reduces almost all the way or until the brussel sprouts can be pierced with a fork. * Note: For greens, I used a package of turnip, mustard, and collard greens. Feel free to use whatever greens you like. You can find vegan Worcestershire sauce at health food stores and online. Liquid smoke gives dishes a smokey taste (similar in effect to if you add bacon to a dish). Make sure your beer is vegan! I used a wheat beer. 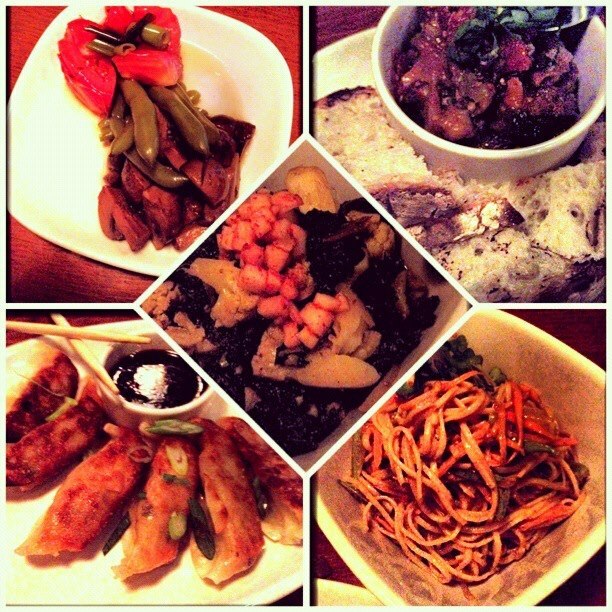 MANA food bar is a small Wicker Park vegetarian tapas restaurant. I was first introduced to this gem several years ago and have yet to be disappointed. About half their menu is vegan and very inspired by Asian flavors as well as other world cuisines. You can order small plates or large plates of most dishes. I would recommend getting a variety of small plates to try out different items. Don't go overboard, though! Get a couple dishes and see if you are full and then order more if you'd like. The items can rack up in price if you don't do it that way. MANA is moderately priced so expect to pay about $50-$70 a meal with alcohol. The last time I went there, I took pictures with my iPhone, so excuse their quality. The lighting in the restaurant is not the best. Be warned also that this restaurant is pretty small, so you might be waiting for a table (unless you go during good weather seasons when they have a small outside table area too). For appetizers, we had the pickled veggies, caponata, and the sesame noodles, all small sized. The pickled veggies were good - tomatoes, green beans, and mushrooms. I didn't care for the tomatoes as much as the other two. One of my favorite dishes at MANA is the caponata. If you are not an eggplant person, do not get this dish. If you love eggplant like myself, you will thoroughly enjoy this tapas plate. I highly recommend one tries this item! The sesame noodles were pretty good as well. It was my friend's least favorite of the variety of small plates we got, but I'd get it again. In the past, I've also tried the spinach and pear salad and it is also one of my favorites on the menu. For hot plates, we got the curry dish, ma po tofu, and gyoza, again all small sized. The gyoza are really good - just your standard fried veggie dumplings, but delicious. I preferred the curry dish over the ma po tofu. Once again, if you don't like eggplant, don't get the ma po tofu dish. The lentils in the curry plate were a nice added touch too. In the past, I've had the tofu bulgogi dish and it is one of my favorites on the menu. I highly recommend trying out that plate. My friend also had the tamale and the potato pancakes. He really enjoyed them both, particularly the potato pancakes, but be warned neither are vegan (he's a vegetarian). If I had to go with a top three favorite dishes at MANA, I would choose: bulgogi, caponata, and gyoza. The sesame noodles run a tie with the gyoza in my opinion. Be sure to check out this quaint Wicker Park establishment for a nice vegetarian meal! Pictured: top left - pickled veggies, top right - caponata, middle - curry, bottom left - gyoza, bottom right - sesame noodles. 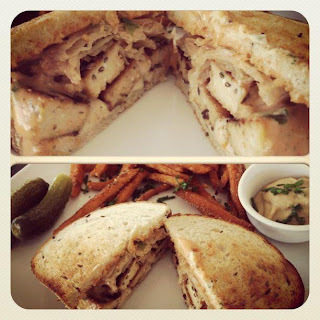 A long time ago, I made a seitan Reuben sandwich that was mighty yummy (I also have a California Reuben sandwich with a killer vegan turkey meat recipe). I thought I'd change it up with tempeh this time and a marinade. Combine all marinade ingredients in a large ziplock bag. Add tempeh. Marinate for 1-2 hours up to 24 hours. Heat a skillet over medium heat. Add tempeh slices (no need to add oil since it is in the marinade). Cook until golden on both sides. Toast the rye bread. Place vegan cheese on bread. Melt cheese (I toasted on a skillet and the cheese melted that way). Add sliced tempeh, sauerkraut, and thousand island dressing. * Note: The tempeh I used was Lightlife flax seed. I used juniper berries and caraway seeds in the marinade because they are used in corned beef preparations. If you don't have these items, then you could probably omit them. The vegan thousand island dressing I used was my own from a seitan Reuben sandwich recipe I posted a long time ago (Russian dressing is essentially thousand island). For vegan cheese, I used Daiya's wedge harvati. Usually Swiss cheese is used in Reuben's, but I don't know any vegan Swiss cheese. So, I went to another white cheese other than mozzarella. For ricotta, I usually use a tofu mixture. I saw Tofutti made a vegan ricotta which I'd never heard of store bought vegan ricotta before. I thought I'd make a lasagna out of it! Maybe next time I'll make a pasta. Overall, the Tofutti ricotta turned out lovely in this lasagna. I think I may prefer it over a tofu mashed ricotta mixture. It gave it a more authentic feel. In a big pot of boiling water, add a pinch of salt and drizzle of olive oil and cook 4 sheets of lasagna noodles at a time. Combine the spinach, pesto, ricotta cheese, Parmesan, oregano, thyme, salt, nutmeg, and pepper in a bowl. Spread a layer of tomato sauce in a baking dish. Add a layer of noodles, tomato sauce, and ricotta mixture. Repeat layering this way and finish the top with just a layer of noodles and tomato sauce. Bake for 35 minutes uncovered. Add the mozzarella shreds to the top of lasagna and bake for another 10 minutes. * Note: I made the pesto fresh from scratch, but you can opt use store bought. The ricotta cheese is from Tofutti. The vegan Parmesan I use is Galaxy brand. Lastly, the vegan mozzarella shreds I used was Daiya.